Family. Opening presents together. Sitting around laughing about who got the worst gift. Reminscing over the previous years and some of the funny gifts my mom would give us. Like one year my mom gave all the girls "in the bedroom" type undergarments that should only be gifted by your significant other. If you get what I mean. I don't think we all laughed as hard as we had that night. Here is the kicker, they even had our horoscopes on there. Problem? They weren't right. And now? I can't stop giggling just thinking about it. The best part of Christmas is just that. Having the ones you love closest to you and making and sharing memories together. Opening the gifts and seeing the kids' faces light up is up there as well. The traditions. All the little things we do the month of December. It's such a special time of year. And it goes by way too fast. Well. Here is the thing. I work this year on Christmas Eve and Christmas. That is unless baby Graham decides to grace us with his presence into this world before so. Otherwise? Whatever day it may be, we plan on celebrating Christmas at my parents' house one night, and then having Andrew's side of the family over another day. 4. Do you wrap your presents all in one box, or do you like wrap each present separetely? It's terrible. I am obsessed with wrapping each and every present separately. No matter what it may be. Two pairs of the same shirt but in different color? Separate box. Pieces of jewelry, earrings and necklace? Separate. And so there are a million and one presents under the tree, but trust me... it's not as extreme as it may look. I did a post on this here. We are always adding on traditions, especially as the kiddos grow. I was reading a post from Newly Wed Moments and I found your bog. I'm so glad I did! Love doing these posts every week, where's the questions for next week? I love you to the moon! I secretly hope Graham appears right before Christmas that way you can all have a very special Christmas as a family of four and you won't have to go to work on Christmas Eve and Day lol! 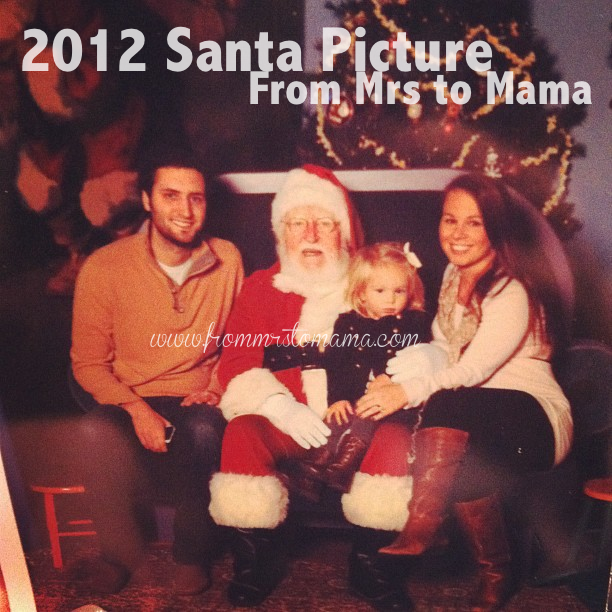 That Santa picture is so adorable, Elli's face is cracking me up, reminds me of Kelcee's unsure face of Santa and then she looks so content cause momma and papa are there lol. Kelcee just started being really scared of Santa and does the death grip around my leg or the hubs neck if he is across the room from her! I am laughing so hard about the gag gifts your mom gave you girls, our family does gag gifts too it is hilarious...one year my hubs twins hubs always complained of nose hair and that he disliked his so we got this really big HTV Big screen box and put the nose hair trimmer in it hahahahah! He later did get the TV already set up from his wife and all of us but it was funny his face hahahahhah he was so pumped about the tv and in the box was a nose hair trimmer hahahahhaha! That by far has me laughing out loud typing it! Girl we keep adding new traditions as Kelcee gets older. Like this year Elf on the Shelf it is so fun, I have so many ideas for you when you need them! I want to thank you so much for that wonderful post about me! I am going through so much and I really really needed it...thank you! I love reading all of your Christmas love and gurlfrannnnn I wrap each and every gift seperate too the hubs laughed at me just last night because I wrapped all his sisters bath and body works stuff seperate hahahah! He said why didn't you just put it in a gift set I said well she likes a little of this and a little of that and they didn't have a gift set for it he said well you should of made your own I said I did and see I wrapped a seperate basket for her to put it all in hahahhahah! He laughed so hard, so girl I think we share the love of wrapping pressies, oh and I got this new hot pink hand thingy for scotch tape after cussing it for two hours I figured out how to work it and it rocks ha! I'm sorry you have to work on Christmas Eve and Christmas. Come on, Graham! Be a Christmas gift!! WOrking over Christmas is not nice :( This year is my first year, not working for Christmas in 12 years. The gifts from your mom made me giggle!